A hunter sits on the dead body of one of the last remaining Korean tigers captured and killed by the Japanese colonial rule over the Korean Peninsula while a group of villagers look on. The tiger is a symbolic animal for Korean folks as the magnificent animal appears in the tale of the Dangun Legend together with a bear. Throughout the centuries Koreans both feared and revered the top predator as the most propitious animal along with the legendary animal of the dragon. It was used as the symbolic emblem of the 1988 Seoul Summer Olympics. Tigers still are widely favored as the most symbolic animal for most Koreans. But, sadly it is not clearly know when the tigers became extinct in this land of tigers where the big wile cats roamed by the hundreds freely for hundreds or perhaps thousands of years. Not many Koreans know of when and how the Korean tigers disappeared from the Korean Peninsular at least from South Korea. 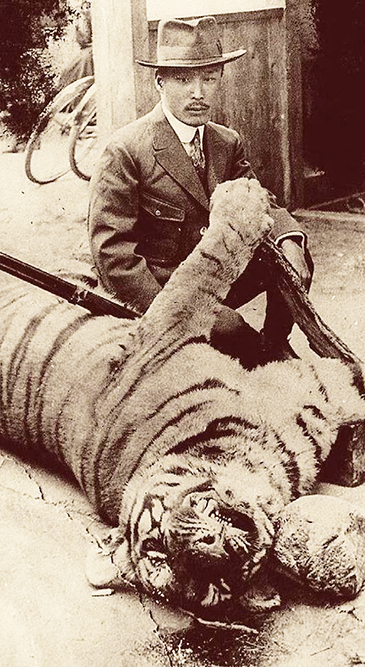 A Japanese hunter poses for a camera with the last Korean tiger he killed on Mt. Daedeok in Gyeongju, North Gyeongsang Province, S. Korea in 1921. It is none other than a Japanese man Mr. Endo Kimio (遠藤公男) who traced the last remnants of the disappearing tigers on the Korean Peninsula. The honorary chairman of the Japanese Wild Birds Association (野鳥會) kept track of the Korean tigers for the last 20 years before he came up with his own book titled "Why Korean Tigers Disappeared?" released in 2009 by Adam Books. In the foreword of his book he made a sincerely apology to Korean folks for the mass killing of the Korean tigers by the Japanese hunters and explorers at the turn of the century and thereafter. "Behind the extinction of Korean tigers are terrible violence and ruthlessness of the Imperial Japanese," he wrote at the start of his volume. "I just want to apology to the Koreans"
His book, first released in 1986, tells the tale of Korea's last tigers captured in 1908 in Mt. Bulgap in Yeonggwang in South Jeolla Province and one captured in the same year in Mokpo in the same province. The one caught in Mokpo still remain as a stuffed animal at Yudal Elementary School in port city of Mokpo after undergoing the process of taxidermy. It is the only remailing stuffed tiger in the entire nation. Mr. Endo Kimio also tells of the last Korean tiger captured on Mt. Daedeok in Gyeongju in 1921. 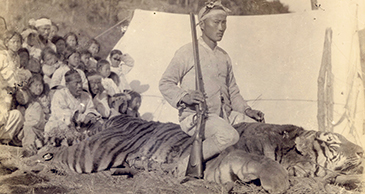 Korean Tiger Captured on Jindo Island — Hunters pose in front of the Korean tiger captured by them on the island of Jindo, South Jeolla Province, South Korea. The photo was taken around 1903. Unlike people's conception that the tigers were living in the wooded mountainous areas a number of Korean tigers preferred to live in the swamp areas of Korea's southern provinces including islands for easy preys like water deers. He rummaged through the old documents at Seoul National University library and other libraries to explain about the captures of tigers during the Japanese colonial period of between 1910 and 1945. According to him, the last Korean tiger, subspecies of Siberian or Amur tigers, was shot dead on Mt. Daedeok in Gyeongju in October of 1921. He even met in person and interviewed a villager Kim Yu-Geun who was injured by the tiger and later died of the wounds. He narrates in his book that the villager Kim and a couple of other villagers went to the mountain to make wood just before Chuseok Holidays. The tiger attached Kim on the front and the A-frame on his back saved him from the tiger attack. At the time a Japanese aristocrat from Imperial Japanese Household was touring the ancient city of Gyeongju and heard about the tiger attack. A Japanese official and his Korean aide (hunter) pose in front of the two tigers they captured in 1917, the year Japanese wiped out all the big cats and other wild animals on the Korean Peninsula. He mobilized hundreds of villagers as the tiger chasers and trackers before he and two hired hunters killed the tiger on the ridge of the mountain. The tiger weighed 153 kg and was 2.5 meters. 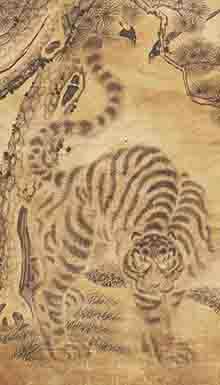 The tiger skin was sent to the Japanese Imperial Family as a gift. 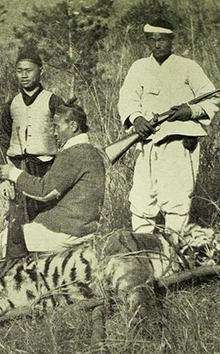 To kill the last remaining tiger he had to ask Japanese policemen to join the tiger hunting. According to Mr. Endo Kimio's book during the period hundreds or thousands of wild animals were hunted down or killed every year by the Japanese on the excuse of protecting people from the wild beasts. In one year a total of 24 tigers, 24 leopards, 236 bears, and 228 wolves were hunted down on the Korean Peninsula by the Japanese colonialists. The stuffed tiger at Yudal school was caught by the villagers in 1908. They killed the tiger in trap with bamboo spears before they sold it to a wealthy Japanese merchant who later donated it to the school. For the mass killing of Korean wild animals tends of thousands chasers and trackers were mobilized by the Japanese particularly during the years of 1910s and 1920s. 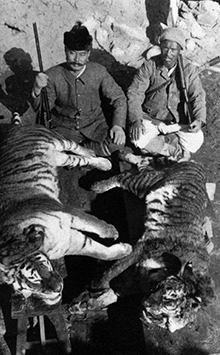 A old Korean record shows that a total of eight Koreans were attacked and killed by the tigers in 1915 alone. This represents how many wild tigers were roaming on the Korean Peninsula, once called the land of tigers. The Japanese colonialists came up with a pan-national campaign of killing dangerous animals which was used as an excuse for driving the Korean tigers and other big animals into extinction, experts argue. This majestic work of Korean folk art depicts a tiger with a magpie under the old pine tree. Traditionally tigers were revered by Koreans as the propitious animal that brings good luck like magpies in Korean folk tales. In 1915 alone 11 tigers, 41 leopards, 261 bears, and 122 wolves were tracked down and killed by the Japanese rulers who mobilized thousands of police and military forces as well as tens of thousands of locaql hunters and chasers. In the following year 13 tigers, 95 leopards, 168 bears, and 106 wolves were wiped out by the Japanese. According to the Japanese Governor General's Office of Korea, a total of six tigers were captured in South Jeolla Province alone in 1924. During the early years of the colonial period, all the major big wild animals including Korean tigers were killed by the Japanese rulers by the hundreds every year. Eight more tigers and 103 more leopards were captured from 1933 and 1942. But it was only North Korea's mountainous areas including North Hamgyeong Province that the tigers and leopards were captured and killed from the period of 1933 and 1942, meaning most tigers were already wiped out from the southtern parts of the Korean Peninsula. What is interesting is that from 1936 and 1942 an occasional tales of tiger victims were reported still in South Korea's southern provinces. Now experts agree that the Korean tigers, the same spices as Amur or Siberian tigers, disappeared completely from the Korean Peninsular particularly from South Korea. "We cannot merely blame Japanese for the extinction of the Korean tigers," an expert argues. "But the Japanese dealt a fatal blow to the extinction of the Korea's most symbolic animals"